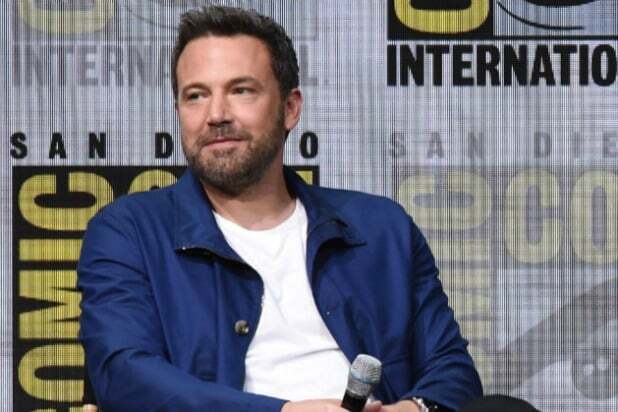 If Warner Bros. hoped to quell rumors this week that it is seeking to find a new Batman, it couldn’t have asked for a better means of doing it than the ecstatic display of loyalty by Ben Affleck Saturday morning in Hall H.
Just two days after a rumor broke that Warner Bros and Affleck are looking for a way for him to “gracefully” exit the role, Affleck appeared at the studio’s San Diego Comic-Con presentation. And he was all smiles, with an equal measure of practically fanboy level hype. He also seemed to be making it crystal clear that he is determined to remain under the cowl for the foreseeable future. As the “Justice League” portion of the panel kicked off, Affleck, along with costars Ray Fisher, Ezra Miller, Gal Gadot and Ezra Miller, walked through the audience rows toward the stage while the film’s heavily-featured cover of “Come Together” blasted. “Being Batman is the coolest f—ing part in any universe. I’m so thrilled to do it,” Affleck practically shouted as soon as he was on stage. “It’s f—ing amazing [to] have this history of this great studio… They said to me, ‘We want you to be our Batman and I believe them.” So much for all that talk of behind-the-scenes discord. Affleck was originally set to direct a stand-alone film, “The Batman,” before dropping out to focus on merely appearing on camera. And he took great pains to make it clear that he’s 100 percent on board with his replacement behind the camera, Matt Reeves. Affleck’s enthusiasm at least appears to be the definitive shoot-down of a rumor published Thursday by The Hollywood Reporter that Warner Bros. is keen to replace Affleck as the caped crusader for undisclosed reasons, but wishes to do so “gracefully” with an in-universe explanation addressed in a future DC film. The report even held that Affleck himself is dying to get out of the role. At least on Saturday morning, that definitely didn’t appear to be the case. "American Horror Story: Cult" FX wasn't clowning around by releasing the first footage ahead of the creepy anthology series' Sept. 5 return. "The Walking Dead" Fans got a look at five minutes of footage, plus a flash-forward, during the AMC series' trailer to promote its Oct. 22 return. "Game of Thrones" A highly anticipated meet-up is finally happening, as teased in this sneak peek at the HBO hit's Season 7. "Inhumans" ABC's upcoming Marvel series released new footage ahead of the Sept. 29 premiere, although the latest trailer proved to be polarizing. "The Gifted" Fox dropped a new promo for the Marvel series about a suburban couple whose children yield mutant powers. The premiere airs Oct. 2. "Fear the Walking Dead" More death is (unsurprisingly) on the horizon when the second half of the AMC series' Season 3 launches Sept. 10. "Teen Wolf" The fur is definitely flying in the MTV series' final 10 episodes that kick off July 30. "Vikings" Ivar the Boneless is back for Season 5 of the History series, which returns Nov. 29. "Star Trek: Discovery" Captain Gabriel Lorca (played by Jason Isaac) is in action in the highly-anticipated CBS All Access show, which debuts on Sept. 24. "Westworld" Disorder and violence seem to have taken over in the Season 2 trailer for HBO's "Westworld," which returns in 2018. "Stranger Things" The new trailer for the Netflix series is rooted on one fundamental principle: Michael Jackson's “Thriller” is awesome. “The Defenders” Four great Marvel superheroes band together to save New York. “The Defenders” premiered on Netflix on Aug. 18. “Arrow” The trailer from the upcoming sixth season includes the highly anticipated return of Manu Bennett as Slade Wilson. “The Flash” A very different Team Flash is seen in the Season 4 trailer, one led by Iris West in the Cortex and Cisco & Wally in the streets. “DC’s Legends of Tomorrow” TV’s wackiest superhero series brings the circus to town in Season 3. “Gotham” Bullets fly and bodies drop in the Season 4 trailer. “Lucifer” Season 3 heats up with Lucifer strutting his fine self in search of a little pleasure. “Supergirl” A rededicated Supergirl is front and center, as new threats are primed to descend on National City.